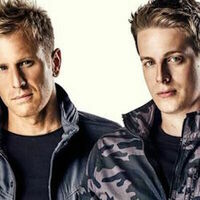 After earning a spot on MTV Clubland’s “10 Artists to Watch in 2013″ list, TRITONAL have continued to launch track after track on to the Beatport charts and ignite dance floors around the world with their energetic and unforgettable sets. The duo unleashed their debut studio album to the world in 2011 with “Piercing the Quiet”, which produced eight Top 20 Beatport singles including five that held the #1 position on the Beatport trance chart for more than three weeks. Currently masters of their own “Metamorphic” series of EPs, TRITONAL conjures its audio alchemy with revelatory releases like the recent “Metamorphic I” featuring “Bullet That Saved Me” and “Follow Me Home”. “Metamorphic II”, out November 25, 2013 features the recent smash hit “Now Or Never” as well as the buzzed about and as yet unreleased “Electric Glow”. Having just wrapped their first 40-city headlining North American “Metamorphic” tour, TRITONAL continuously receive peer support by fellow DJ kingpins including Armin van Buuren, Hardwell, Tiësto, Ferry Corsten, Steve Aoki, Markus Schulz, Gareth Emery, Nicky Romero, and many more.